Amidst a gala “Masquerade Ball” atmosphere of a masked audience in formal attire, the Huntsville Madison County Chamber celebrated the city’s entrepreneurial community in the 33rd annual Small Business Awards. Gary Bolton, the Chamber board chair and vice president of global marketing for Adtran, welcomed the crowd to Tuesday night’s affair. Hank Isenberg, Chamber vice president, small business and events, and Haley Baker of WAFF-TV were the emcees. “We are celebrating the most successful” small businesses, Bolton said. “We received 650 nominations and there are 155 contenders,” he said. “There are 1,100 people here” … in the soldout event held in the Von Braun Center’s North Hall. Lynn Troy of Troy 7 received the prestigious Russell G. Brown Executive Leadership Award, the top honor presented annually. 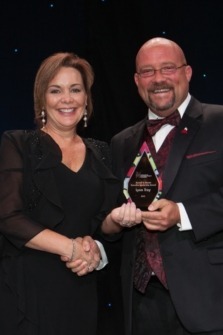 Canvas was a double-winner, capturing the Woman-owned Business of the Year and the Government Contracting – Technology Business of the Year awards. Mary Taylor Griffith with Aleta Technologies was named the HASBAT Small Business Advocate for Excellence. A new category debuted, saluting the area’s booming growth – Local “Creative” of the Year. It was won by Pizzelle’s Confections. The other winners were: Rocket City Digital, Emerging Business of the Year; Flint River Dental, Medical Practice of the Year; Capstone Realty, Professional Services Business of the Year; Kristina Sexton of NXTSTEP Family Law, Young Professional of the Year; Downtown Rescue Mission, Nonprofit of the Year; MartinFederal, Government Contracting – Professional Services Business of the Year; Earth and Stone Wood Fired Pizza, Culinary Business of the Year; Matt Curtis Real Estate, Service Business of the Year; and Summit Information Solutions, Technology Business of the Year.